Scott Shotton has over 25 years of technical experience in automotive repair shops. As the owner of The Driveability Guys, Scott performs mobile diagnostics and reprogramming for local repair shops in the DeKalb Illinois area as well as industry training around the United States and Canada. He was also one of the four trainers for the Illinois EPA’s vehicle emissions testing program. Scott has been an automotive instructor at Kishwaukee College since 2009. Prior to Kishwaukee College, Scott was adjunct faculty at the College of DuPage for 7 years. He has a degree in Automotive Service Technology as well as many hours of training by manufacturers and independent training entities. Scott is also recognized as an Illinois state emissions repair technician. He was also a technical trainer during his 8 year Army career. Scott has written many technical articles for MotorAge and Gears magazines. Scott became an ASE Subject Matter Expert (SME) in 2017. Scott currently maintains 21 ASE certifications including Master Automotive Technician, Master Truck Technician, A9, L1, L2, L3, Alternate Fuels and more. Look for Scott’s other episodes HERE. Eric Ziegler owns and operates EZ Diagnostic Solutions Inc in Peoria, IL. Eric specializes in module programming, driveability, electrical and network systems diagnostics. Eric has over 30 years of experience as a technician with an extensive diagnostics background. Eric supports collision centers and auto repair shops and has one tech in his mobile diagnostic business. Eric Ziegler is an ASE Certified Master Tech • L1 Advanced Level Diagnostic Specialist • L2 Electronic Diesel Engine Diagnostic Specialist • L3 Light-Duty Hybrid & Electric Vehicle Specialist • ASE Certified Medium Duty Truck Technician. Eric is an ASE Recertified Advance Level L1 Master Technician who has spent a great deal of his career focusing on automotive electronics, engine management diagnostics, module programming, and network communication. In addition to owning and operating EZDS, Eric is an accomplished automotive trainer working for Automotive Seminars and the Driveability Guys training technicians in the latest diagnostic techniques and technologies throughout the Midwest and US. He regularly attends and trains at some of the automotive industries top training events like Vision KC, ASA ATE, Automechanika, NESSARA, AV Tech Expos, KOI, Indiana ASA and the CAN Conference. Eric’s previous episodes are HERE. Dave Denmon founded Dave’s Car Care (formerly known as Dave’s Tire and Auto Corral) in 1980. He has been very active in the community, sponsoring Food for the Hungry, the Phoenix Women’s Shelter, Little League, girls’ softball teams, and established Sunnyslope Ministers of Hope to feed local homeless. Gerson Carcache is an ASE Certified Tech at Dave’s Car Care. We would like to assist shops in developing exceptional technicians, improving shop culture, increasing the effectiveness of communication and improving the bottom line for everyone involved. The technicians we train will become better technicians and improve their self-confidence. This higher level of skill will contribute to the bottom line of your business. At the same time, we will promote effective communication between technicians, service writers and shop owners. All of these aspects contribute to a positive shop environment, or culture, which will allow all of the parties involved to be happier and more profitable. Through hands-on technical training, technician assessments, business assessments and meetings with all of the individuals involved we will change your way of thinking and facilitate the advancement of our industry. What is technician mentoring? Technician mentoring is a training program that is focused on technical proficiency. However, it goes beyond technical training. Technician mentoring promotes effective communication, positive attitudes, effective teamwork, positive shop culture and a higher bottom line for everyone. Passionate technicians, in the appropriate environment, produce quality work and contribute to the business as a whole. As a result, everyone involved in your business team is happy and enjoys the spoils. The key word in the last sentence was “Team.” Although technician mentoring strives toward making technicians better at their jobs, we also encourage the team aspect to benefit everyone involved. EZ Tech Mentors website HERE. 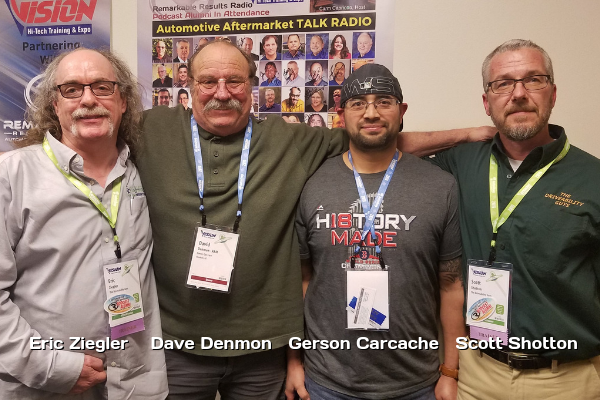 Thanks to Scott Shotton, Eric Ziegler, Dave Denmon and Gerson Carcache for their contribution to the aftermarket’s premier podcast. EZ Tech Mentors website HERE. Link to the ‘BOOKS‘ page highlighting all books discussed in the podcast library HERE. Leaders are readers. Leave me an honest review on iTunes. Your ratings and reviews really help and I read each one of them. Subscribe to a mobile listening app HERE. The auto care industry is revving up. New technologies are changing cars and the way people use them. To stay in the driver’s seat of all these advancements, you need to take charge of your learning, your business, and your legacy. That’s where the 2020 NAPA EXPO comes in. With help from industry experts and the best suppliers and manufacturers, the 2020 NAPA EXPO will provide the innovations and answers you need to charge forward into the future. This is your chance to network with experts in the industry. Discover the latest innovations that will help you stay market competitive. Learn more about new products, services, and equipment. You will be using them every day. Join us in Las Vegas, April 6-9, 2020! Contact your NAPA AUTO PARTS store today to reserve your package for this can’t miss event. Enrollment is going on now. To learn more about NAPA AutoCare and the benefits of being part of the NAPA family, visit www.NAPAAutoCare.com.